The RStudio Compile PDF command typesets the current TeX or Rnw source file into a PDF. There are a number of options you can specify to control this process, the most important of which is which LaTeX program you want to use for typesetting. RStudio is compatible with both the pdfLaTeX and XeLaTeX typesetting engines. You can also specify a custom LaTeX program by setting the RSTUDIO_PDFLATEX environment variable (see below for more details). The default LaTeX program is pdfLaTeX and you won't normally need to change this unless you require specific features or capabilities offered by XeLaTeX. It determines the program used for LaTeX typesetting when you are not within a project. It is used to initialize the program used for LaTeX typesetting for newly created projects. Note that changing the global default will not change the default for previously created projects. The section below includes information on setting per-project defaults. You can also specify the program to be used for LaTeX typesetting on per-file basis. You may want to do this either to override the global or project-level default, or if you want to share the file and ensure that the correct typesetting program is used on other systems. Note that these directives are based on the syntax used by TeXworks for the same purpose, so if you edit files in both RStudio and TeXworks they will both respect the specified program. For compatibility with TeXShop RStudio also respects the use of 'TS-program' (rather than 'program') as a keyword, for example: !TeX TS-program = XeLaTeX. 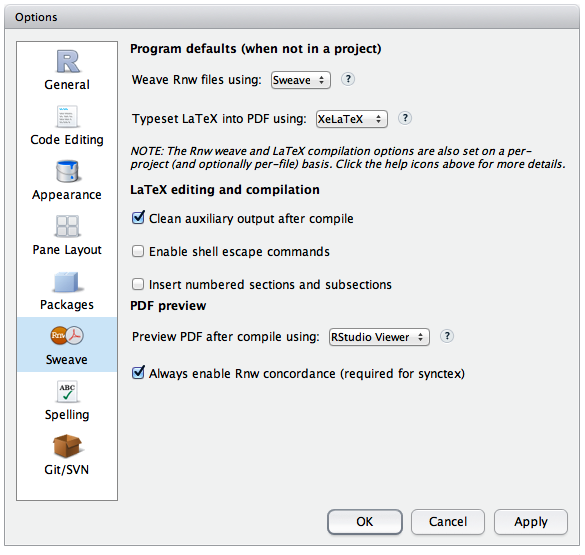 If you want to specify a custom LaTeX program you can do so by setting the RSTUDIO_PDFLATEX environment variable. Note that this will override any current global or per-project LaTeX program options, however will not override a per-file setting. The environment variable must be set before you try to weave the document. RStudio will pass the -file-line-error (or -c-style-errors for MikTeX) option to indicate that it wants errors formatted with C style file and line information. RStudio will pass the -synctec=-1 option to indicate that it wants a synctec file created (to enable direct navigation between the editor and PDF preview). RStudio will pass the -shell-escape (or -enable-write18 for MikTeX) option if shell escape commands are enabled (see below for details). If the LaTeX program you specify is not known to work correctly when invoked from within texi2dvi, you may wish to disable the use of texi2dvi (see below for details).